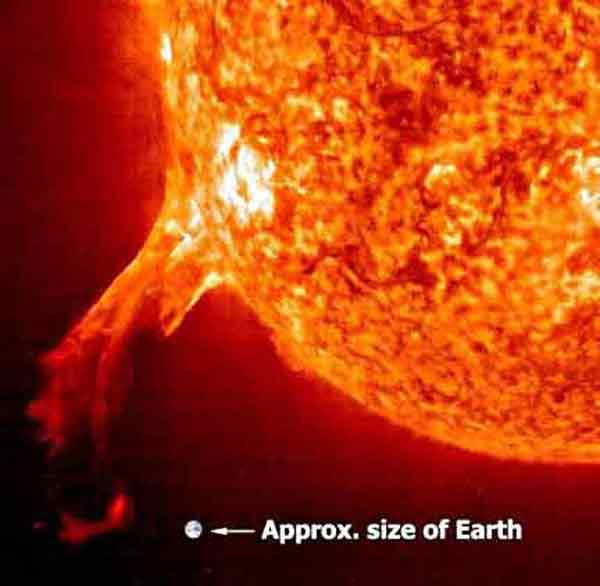 Size comparison of the solar flare compared to earth. Don't worry, in reality we are not that close. Solar power often faces criticism as an alternative energy due to its low conversion efficiency, but this doesn't necessarily limit its value. A scienitist called Matthias Loster has produced a solar power map of the world here showing how we don't have to cover the whole earth with ugly solar panels to make every other source of energy obsolete. In fact, the panels just need to be positioned in the sunniest spots on earth. Solar power truly is a great answer to our power needs. Yes, there are costs involved and solar technologies do still need a lot of work, but to change something from an idea to a usauble product you need to take action. Some scientists at the Cohen lab at the University of Oregon are doing just this and are aiming to create inexpensive, efficient, thin film solar cells. D.W.Miller, a Graduate Research Fellow with the group, said: "Most of our experiments are built to work on a functioning solar cell". Using a Linkam LTS350-W-PB4 stage they can take advantage of how a photovoltaic device works to study fundamental properties of the components of the solar device. In order to do their experiment they had to modify the Linkam stage by building an additional contacting system comprising a series of spring loaded flexible steel rod arms with gold pogos at the end. This enterprising set-up gives them a firm, stable electrical contact with their sample at all temperatures. When asked about the benefits of the Linkam stage, D.W.Miller added: "There are tons. They are more reliable, they sweep temperature more rapidly and stabilize more quickly at temperature, they provide easier access to the sample, are sturdier and more efficient". Its always fascinating to find out how our customers use our stages, but in this case it is extra special to see how our original design has been a source of innovation and creation, and is now helping a very industrious group of scientists work towards solving the energy problems of tommorrow.